Cardiac surgery is a known risk factor for acute kidney injury (AKI) in children. However, cardiac surgery-associated AKI (CS-AKI) in neonates has not been well studied. 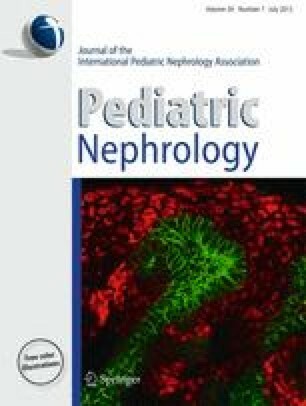 The objectives of this study were: (1) to describe the epidemiology of CS-AKI in neonates utilizing the Acute Kidney Injury Network (AKIN) definition, (2) to identify risk factors for neonatal CS-AKI, and (3) to determine if neonatal CS-AKI is associated with increased morbidity and mortality. This was a retrospective study involving 122 neonates (≤28 days) undergoing cardiac surgery from 2006 to 2009. Neonates with and without AKI were identified using serum creatinine (SCr) and urine output (UO) data. Cardiac surgery-AKI occurred in 76 (62 %) neonates, of whom 22 (29 %) were AKIN stage 1, 19 (25 %) were stage 2, and 35 (46 %) were stage 3. AKI mostly occurred early as 75 % of patients achieved their maximal AKIN stage within the first 48 h post-operatively. In the multivariate analysis, cardiopulmonary bypass duration of ≥120 min was independently associated with AKI [odds ratio (OR) 2.53, 95 % confidence interval (CI) 1.03–6.30]. Severe AKI (AKIN stage 3) was independently associated with mortality (OR 6.70, 95 % CI 1.08–41.50) and a longer stay in the pediatric intensive care unit (hazard ratio 9.09, 95 % CI 1.35–60.95). The majority of severe AKI cases (65 %) were identified with AKIN UO criteria alone without significant rises in SCr. Cardiac surgery-AKI is common in neonates when the AKIN definition is utilized and is associated with higher morbidity and mortality, especially in those with more severe AKI.